A great list of everything else we do! Don’t settle for a DJ who “stands there and pushes buttons”. A good DJ is an “on-site” planner! We will coordinate everything from the time the first guests walk in until the last guest leaves! 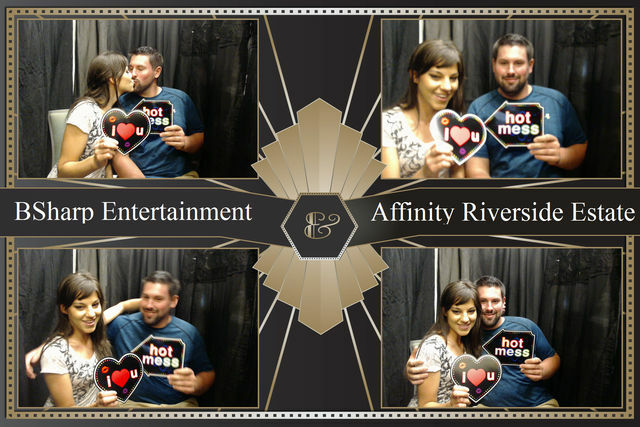 A Photo booth is a fun, unique way to add excitement to any event and guests end up with great party favors to keep, plus, you end up with ALL images at the end of the night. What a way to remember the party! We offer up-lighting, flush lighting and monogram lighting. Adding professional lighting adds class and intriguing décor to any venue or event space. We can even add up-lighting to tent and outside events for amazing special effects! We have 2 on staff ceremony officiates. Nothing beats a party with BSharp’s fabulous “Ace in the hole” dealers! Our dealers are not only professional dealers, they are paid entertainers who are sure to make ANY party a blast. We provide full service casino parties. Call us for your personalized party quote today. Team Trivia parties are a great way to raise money for your cause, or put a different and exciting spin on your next Christmas party. We host both the “Traditional” Trivia nights as well as a more casual trivia party with “Pop Culture” sound clip Trivia shows. Too many possibilities to list!!!! Black light bashes make amazing Sweet 16, Halloween and New Year’s parties. Trying to raise money for a charitable organization? Ask about out Glow in the Dark BINGO fundraisers for non-profit groups! Do you like BINGO? How about music trivia? Well, SINGO is music trivia…BINGO style! We include all party accessories, and our fun emcee will make it a night to remember! Full Service planned events: This package is very specific to exactly what all you want included, but is a PERFECT option for the company Christmas party, or any gathering where you need the planning to be simple, and the party to be amazing! Lower price range reflects a basic buffet and entertainment, with a full cash bar. We do have options for more extensive food and entertainment. We would gladly put a personalized price together for you based on your specific needs.